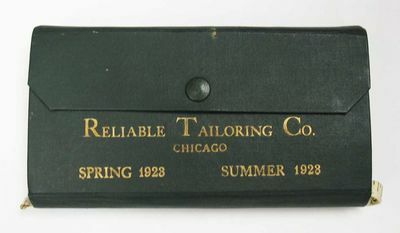 Chicago: Reliable Tailoring Co, 1923. 1st printing. All housed in green wallet-type porfolio, with snap closure & gilt stamped lettering. Minor wear to wallet. Crease to booklet front wrapper. Some fraying to a few sample edges. Withal, a respectable VG [or better] example.. Booklet: 31, [1 (blank)] pp. 22 sheet sample book, with first two 8-1/8" x 3-3/4" sheets having 6 2-inch square cloth samples [3 per side], the remaining 20 with 3 samples to one side, advertising copy on the opposite. 3 price list cards [Regular, Wholesale & 'Secret'] in pocket underneath cloth samples. Cloth tape measure laid-in. Oblong orientation. Closed: 4-1/4" x 8-3/8". Open: 8-3/8" x 13-1/4"